Wow! Last week, I participated in a branding strategic implementation meeting with a client and his new branding gurus, goBRANDgo. They covered all the usual questions—How is your industry perceived?, How are you perceived?, etc.—and then they asked something that left my client dumbfounded and impressed the heck out of me. “What do you promise yourself? A pin hitting the floor would have rung out loud and clear. Skillfully, the facilitator, Brandon, remained totally silent until one of the participants identified his inability to answer that question. Isn’t it a great question? 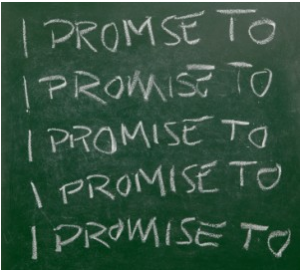 Most of us don’t promise ourselves a whole lot. I think it’s because our Knower/Judger function knows that when we promise something, we’re honor-bound to do it. We can fail someone else and rationalize it. But somehow we can’t bring ourselves to BS ourselves! So we mostly avoid the exercise. Don Miguel Ruiz penned the book The Four Agreements about 15 years ago. It’s a short book with some potentially constructive concepts related to making deals with yourself. They’re promises, and if you make them to yourself, I think you’ll definitely find yourself more in touch with your Learner/Researcher. While I would replace the word “truth” with “reality” (since the HDClarity tools define truth as reality viewed through K/J filters), this agreement suggests we use unfiltered data and remove all preconceived thoughts about who we’re talking to at the time…à la Ho’oponopono. K/J voices in our heads convince us that what’s happening to us or being said to us is some personal attack or vendetta and that we should take up a defensive position. Hence the K/J vs. K/J conflict. When we can stay out of that, we contribute continuously to calm in our immediate environments. It’s the other guy’s problem, not yours. Mary J. Lore, author of Managing Thought, says we have 60,000 thoughts per day during waking hours. Most of them judge something. Right/wrong. Good/bad. Pretty/ugly. Smart/dumb. Our K/J takes those thoughts and creates conclusions, which may or may not be accurate. I totally agree with Ruiz on this point. Getting this under control will completely transform your existence. 100%. No more, no less. I wrote an article a time back on how athletic coaches sometimes implore their subjects to give 110%. In my world of racing cars down gravel roads at over 100 miles per hour, 110% typically means the car is going faster than the driver can handle. This usually ends up in crashes. Yet giving only 95% leaves something on the table. My agreement with my drivers has always been, let’s give every challenge (every turn, every engine modification, every call from my notes) 100%. If we do, then we’ve given ourselves the best chance to win. If it’s not a win, nothing we could have done would have made a difference. We just got beat by a better team, car, or driver that weekend. What do you promise yourself? What deals does your K/J make with you that are working for you? Which ones aren’t? You might consider the Four Agreements as a good starting point. Great article and thank you for the shout out! I’ve never seen the 4 agreements piece before, but that is really cool. I think those are 4 truths that are so simple, yet so many of us often let society pull us away from them. Great interpretation and great article. Glad you enjoyed the exercise! 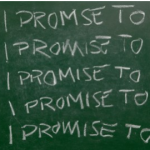 They make pretty good “promises” to make one’s self.